Can you hear pure movement? A force that’s capable of shattering the foundations of our sonic and physical perception? With his background in the raving underground scene of Bristol as well as a degree in architecture, PAUL PURGAS surely is no stranger to ground-shaking experiences. With his duo project Emptyset, PURGAS examines the material properties of sound and what it can do to space. The results of this research have been published on the labels Raster-Noton, Thrill Jockey, and Emptyset’s own Subtext Recordings. PURGAS’s work as a musician and fine artist has been exhibited at Tate Modern and the Whitechapel and Serpentine Galleries in London, among other institutions. We haven’t even started to get into detail about his qualities as a curator, writer and researcher, and there’s more. The best kept secret of all his prolific activities is that PURGAS is an amazing DJ. His rare and highly energetic sets are yet another way to explore the relationship between rhythm, space and movement. Fine artist AIKO SHIMOTSUMA grew up in a Buddhist temple in Japan. As a child, she often watched a wooden log hitting the sacred bell outside of the building and was deeply touched by its vibrations. She draws inspiration from the experiences in this special environment for her installation work that’s centered around the topic of the inner sanctum. Shudder and fascination are transformed into dualities: solid and liquid, transparent and opaque, light and shadow. Movement is also at the core of YUKIHIRO TAGUCHI’s work, who often reflects on processes of transformation through stop motion videos and objects that are in a state of flux. The cardboard sculptures of CARLY FISCHER on the other hand deal with the fragility of our environment as well as our perception of the world. 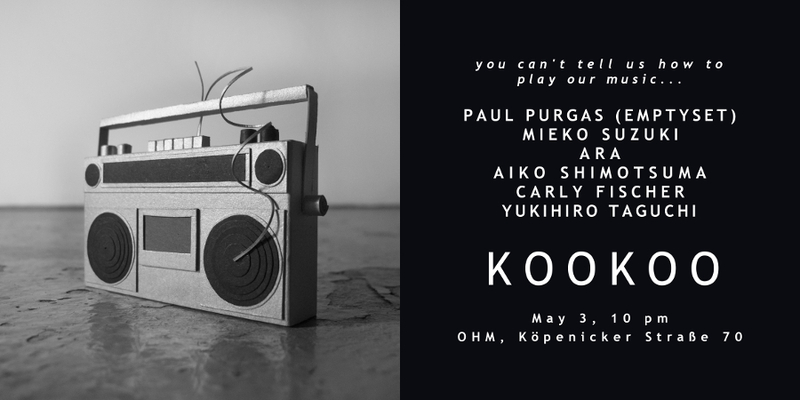 KOOKOO’s hosts MIEKO SUZUKI and ARA will be happy to get into detail about it – and to tell you how they play their music.